Time is flying by and your children are growing up too fast. Don’t you just want to capture these memories forever? Do you wish to cherish what you have today and preserve the beautiful memories of the bond you share with your children forever? If yes, then take advantage of our family photography services today. Schedule a session with us so that we can capture breathtaking beautiful photos of you with your family. Whether you put these stunning photos on your side table or hang them on the wall, they will remind you of all the beautiful moments you’ve had with the most important people in your life. How We Capture the Good Times? We understand that it is a big challenge to get everyone looking their best and in a good mood for a family photography session. However, once you and your family visit with our photographer, you’ll get amazing, feel-good, positive vibes from our staff, thereby ensuring you and your family are excited, comfortable and prepared for the photography session. From striking a pose or two at a beautiful location downtown or having a fun time around nature, we work to create authentic moments of connection between your family members so that they can be captured beautifully in pictures. As Naomi directs the poses for the photography session, you can rest assured that you and your family will look and feel great! With the wealth of experience and expertise that Naomi brings to the table, family photography sessions become easy, fun and memorable. Family photography sessions can take around an hour. We try to keep the session not too long because we understand that children can tire out easily. 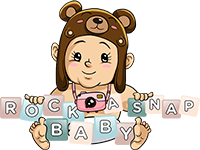 At Rock a Snap Baby, we give you the opportunity to choose the perfect location for your family photography session. When you book your session you will receive a confirmation as well as a list of locations we recommend. To ensure we provide you with high-quality photos, we hold a limited number of sessions every month. Therefore, book your session today! So, let’s come together and capture those golden moments of your family and all the little details that will change in the blink of an eye. We encourage you to share your ideas, thoughts and how you want the session to be like. We can shoot your family photography session according to your requirements—just the way you want and desire.